Boonar™ is an effects pedal precisely designed to deliver sound and feel of the legendary Binson Echorec, a multi-tap magnetic drum echo unit. When we decided to revive one of the finest magnetic echo-delay machines ever built, we knew it will be everything but an easy task. Months of research, in-depth study, development and fine tuning were needed to bring it back in all its fame. 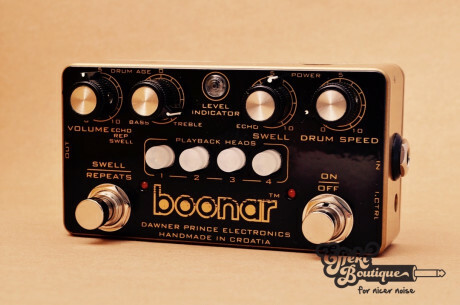 Boonar™ is an effects pedal precisely designed to deliver sound and feel of the legendary Binson Echorec, a multi-tap magnetic drum echo unit. Everything is in there and more: from thick, juicy tube tone, glorious multi-dimensional echo repeats melted with haunting reverb decays, variable delay time up to a full second and separate playback heads switching system to an amazing and distinctive external looks dominated by a gold finish and green pulsating "magic-eye" level indicator, all packed in an incredibly compact stompbox form. Boonar shares the same analog signal path as original Echorec but we used high voltage driven FETs as tube emulators and replaced magnetic memory drum with a DSP unit. We developed a special DSP code that faithfully replicates all the characteristics of the actual Binson memory system that we named a virtual magnetic drum. Reveal an authentic Binson sound and enjoy in magical echoes of the past! controls the output volume of the delayed signal coming from the playback heads. This control is based on Input control setting. adjusts the EQ of the delay signal. Just like in original Echorec machine, this effect is subtle, changing from darker to brighter. sets the amount of regeneration/number of repeats from single repeat (slap back delay-Echo mode) of each playback head to infinite. On the edge of self - oscillation Boonar will start to produce those specific luscious swells that bubble, creating a complex multi-dimensional wall of sound. sets the rotational speed of the virtual magnetic drum which is directly proportional to the delay time of the machine. Unlike Binson Echorec with fixed drum speed and delay time of 300ms max on the 4th playback head, Boonar provides delay times from ~40 ms on the 1st playback head up to a full second (1000 ms) on the 4th playback head! Fully clockwise setting corresponds to the fastest drum speed hence shortest delay times. Binson Echorec delay time setting is at 3 o'clock. this control adds all those sweet aging characteristics specific to Binson Echorec. When new Echorec repeats are bright, metallic sounding and repeat pretty accurately since magnetic drum was quite an improvement over magnetic tape. But with aging there is a slight loss in volume and high frequencies due to a wear/poor playback heads alignment and a very unique modulation is introduced in the delay signal. This modulation is mostly caused by worn mechanical parts that start to irregularly drive the memory disc/drum and unlike other delay modulations this one is more of a vibrato than a chorus effect. With Drum Age control set to zero (fully clockwise), there is a minimum aging effects present in the delay signal. Increasing it to 12 o'clock will add a subtle amount of modulation producing a pleasant 3D effect, while on maximum will introduce a nice warble with noticeable loss in high frequency and volume on the playback heads. Another important characteristics is that Drum Age modulation frequency (the rate of the warble effect) is directly proportional to the Drum Speed - as the drum speed is increased, so is the rate of the warble and vice versa. A lot of time and hard work went into recreating all those characteristics, meaning carefully measuring all the parameters on the actual machines and transferring them into the Boonar's DSP - virtual magnetic drum. controls the level of the input signal to the delay path. This control enables Boonar to accept all kinds of instruments with various signal levels on the input. Cranking the Input Control all the way up will produce those beautiful overdrive effects on the delay, specific to the Binson Echorec. Binson Echorec had a 12-position rotational switch that was used to select different playback heads and combinations for single and multi-tap delay. We wanted to overcome that limitation and added a separate playback heads switches for a maximum of 16 possible head combinations. All four playback heads outputs are true analog. The Level Indicator called a "magic-eye" displays the level of input signal and repeats. switches between standard Repeats mode - a multiple repetitions depending on the Swell control potentiometer and a Swell mode which puts a portion of signal from all four playback heads into the output mixer to produce those reverb - like, "cathedral tone" effects. Boonar utilizes both True bypass and Trails mode simply interchangeable by setting internal DIP switches according to the provided scheme. Trails mode keeps Boonar's preamp and output buffer engaged keeping that juicy Binson Echorec tube tone always on, and when bypassed echoes keep repeating until they naturally decay, depending on the Swell potentiometer setting. Trails mode is factory preset. internal trim pot sets the level of the dry signal coming from the preamp into the output mixer. It is factory set to unity gain. internal DIP switch sets the input impedance from very low - 47K Ohm in Original mode (Binson Echorec mode) to 1M in Modern mode which brings more sparkle, dynamics and a bit more output volume. Modern mode is factory preset. Power Consumption: ~ 180mA / Powersupply not included. I made my first purchase from Effekt Boutique and my first purchase was the "BOONAR" from Dawnwer Prince. I'm really happy with this little machine that plays and goes beyond Binson's possibilities. The chances of having an incredibly faithful sound to the original are so many. I understand why even the great Gilmour used it. Congratulations again to Effekt Boutique for quick delivery in 24 hours.